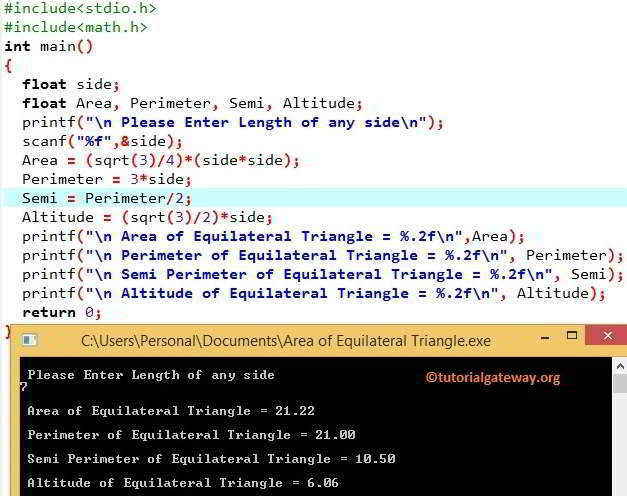 In this article we will show you, How to write C Program to find Area of an Equilateral Triangle, Perimeter, Semi Perimeter and Altitude of a Equilateral Triangle of with example. Before we step into practical example, Let see the definitions and formulas behind the Area of an Equilateral Triangle. This program allows the user to enter length of any one side of an Equilateral Triangle. Using this value we will calculate the Area, Perimeter, Semi Perimeter, Altitude of the Equilateral Triangle. Following statements will allow the User to enter the length of any side in the Equilateral Triangle. In the next line, We are calculating the semi perimeter of an Equilateral Triangle using the following formula. We can also find semi perimeter using the standard formula = (3* side) / 2.